Today is the funeral of Peter Law, the independent MP for Blaenau Gwent who died from a brain tumour last week. In 2001 Labour had won the Welsh valleys seat with 72% of the vote but chose an all-women's shortlist to select the retiring MP's successor. Peter Law, the Welsh Assembly member for the area, stood against Labour's official candidate, Maggie Jones, in protest at Tony Blair's imposition of a female candidate. He successfully overturned a 19,000 Labour majority in last year's General Election and won a more than 9,000 vote majority for himself. "New Labour, in an effort to prevent him from standing for Parliament, offered him a peerage. The man named as being responsible is the Secretary of State for Wales who made the offer on the specific authority of the Prime Minister." "I am at a loss to understand why it is now being alleged that Peter Law would have made such an accusation about me, when he himself never made that allegation public, even when he was standing in the general election. The suggestion that I offered a peerage to Peter Law is utterly without substance. And indeed the Labour Party have made it absolutely clear that no such offer was made." Glad to see this story has made the BBC .I wonder if Hain will sue Mrs Law?I very much doubt it.He's yet another New Labour sleazeball. 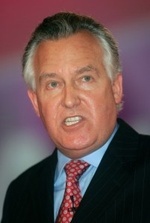 Impeccable timing by Peter Hain to effectively tell Mrs Law she is a liar on the day of her husband's funeral. Some flowers might have been more appropriate. Peter Law was a top bloke who was popular with all sections of the community, no matter what their political persuasion. The girls at work were discussing his funeral today, and they normally take no interest in politics whatsoever.